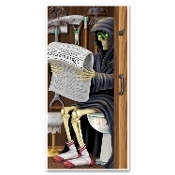 Hilarious bathroom door cover, featuring the Grim Reaper reading The Obituaries! Cover measures 30-inch wide x 5 feet tall (2.5 ft x 1.67 yd) (76cm x 1.52m). Halloween Door Cover Grim Reaper Sitting on the pot, giving it all he’s got! Creepy Grim Reaper also makes a weird gruesome refrigerator door cover, too .